The last few weekends have been spent in the orchard, pruning. Our orchard is a multi-purpose one, so unlike many traditional cider orchards its trees have always been pruned and thus need this yearly maintenance task to avoid becoming impenetrable thickets of competing new growth. Some like the Crispin need only a minor trim, while others like our Charles Ross have reached for the skies and a full-on haircut is required. It's restful work and in a fine winter like this one the orchard is a pleasant place to be. The ground is worryingly dry at the moment, we may have had a bit of rain so the pond that was empty pre-Christmas now has water, but it would be foolish to believe we might not be in for a spring drought. Today's photograph is of one of the trees I don't prune. In fact it's not even an apple. 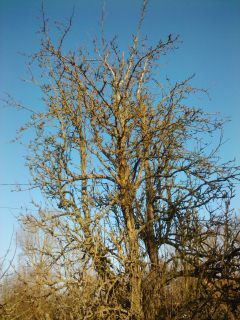 This is our Fertility pear tree in all its dormant glory against a January sky. The pears it produces are very small but sweet, I blend them with cooking apples when I'm pressing juice for pasteurising and drinking rather than cider making.